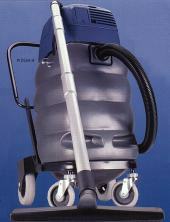 The WD215-H and the WD260-H are thoroughly functional Wet Dry pick-up vacuums that have been produced for the needs of the every day user. The WD215-H and the WD260-H are lightweight machines that require minimal storage space. Large wheels for great mobility. 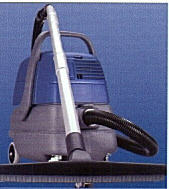 The Euroclean Wet Dry HEPA eliminates many of the problems associated with upright vacuums. It offers mobility and greater efficiency in reaching the debris under chairs, tables and booths. With HEPA Filtration the these units greatly improves indoor air quality by capturing dirt and fine dust particles that the standard upright vacuum typically stirs up. The tank is easy to empty and clean since the filters are never in contact with the water, they will not accumulate mold or mildew. The entire design is ergonomic with first priority given to user comfort and efficiency. Both vacuums come complete with an 8 foot suction hose, (2) aluminum wands, wet/dry floor tool attachment and a crevice nozzle. Tank 4 Gal. 15 Gal. Weight 22 Lb. 46 Lb.